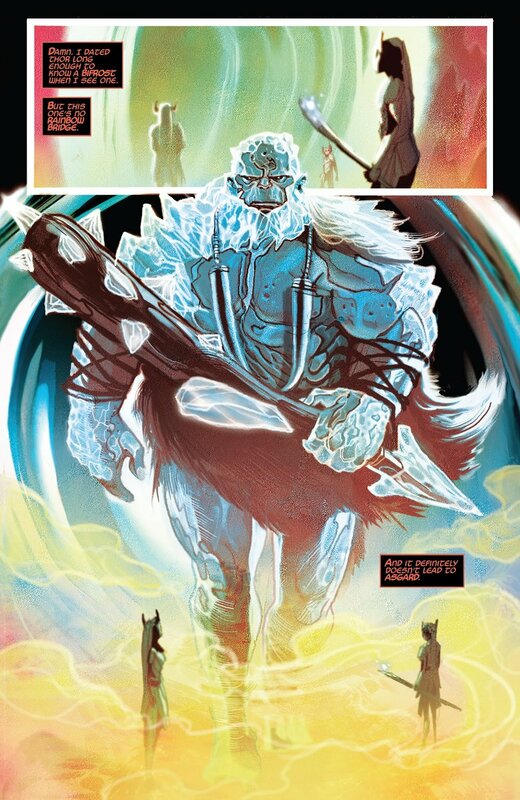 Writer Jason Aaron delivers another spectacular prologue chapter, this time focused entirely on Roz Solomon, in the lead up to his War of the Realms in Thor #9, with art by Mike Del Mundo. Previously, Agent of SHIELD Roz Solomon defended Broxton, Oklahoma from a troll invasion alongside the mighty Thor. Then, they briefly dated, he lost his worthiness (and his hammer Mjolnir), and things got awkward. To add to her grief, SHIELD was disbanded, and Roz was left without a job. Now, she has been approached by Black Panther, newly-appointed chairman of the Avengers, to become an Agent of Wakanda, and carry out secret missions on their behalf. Aaron has a talent for sniffing out the most insane of ideas and squeezing every ounce of story from them as possible. This issue continues that tradition, as the readers are treated to Roz Solomon joining the Agents of Wakanda, a re-imagined SHIELD, as seen through the eyes of Wakandan technology. Everything you loved about SHIELD is cranked up to 11, and enhanced with Vibranium. Seeing as Aaron is setting this new organization up to be an adjunct to the Avengers, there will be plenty of fun to be had with it in all of his books for the foreseeable future, especially when it comes to The War of the Realms. The real heart of this story is Roz Solomon, though. She’s been through a lot in a short period of time, starting out as an Environmentalist Agent of SHIELD, and then being shoved into the background when that organization was shut down. This issue brings her back to the forefront of Thor’s story, and reminds you that she has a lot to explore, character-wise. She didn’t join SHIELD to shoot a gun, but ended up killing 17 trolls in one night. That has clearly weighed on her, and continues to do so as she accepts her new position in the Agents of Wakanda. This is a story about her choosing whether she is going to embrace that side of herself, or let it eat away at her, and Aaron is a skilled enough storyteller to leave it open as to whether or not she makes the right choice. Mike Del Mundo handles all of the art chores in this issue, and he does a fantastic job, as always. His skills normally are at their best when he is tackling pure fantasy (which is why he is ideal for this book), but he doesn’t miss a beat switching over to an espionage story this issue. True, Aaron does play to his strengths still, having Roz fight trolls and frost giants, but Del Mundo’s best scenes are the quiet ones that show off Solomon’s new Wakandan gear, and her interrogation of Dario Agger. Mike always does an amazing job with Thor, but this issue allowed him to show he’s more than just a great fantasy artist. Overall, even though Thor is largely absent from this issue, and it’s essentially a prologue to The War of the Realms, it doesn’t suffer any loss of quality from previous issues. There are still big moments that will have great importance in the upcoming story, including the game-changing Agents of Wakanda, and a few reveals on Malekith’s side of things that will make Thor’s job a lot harder in the chapters to come. Aaron has big plans, and it is clear that he is meticulously laying out the details for his most epic story yet. If you’re having trouble with the pacing of recent issues, hold tight, The War of the Realms is coming soon.